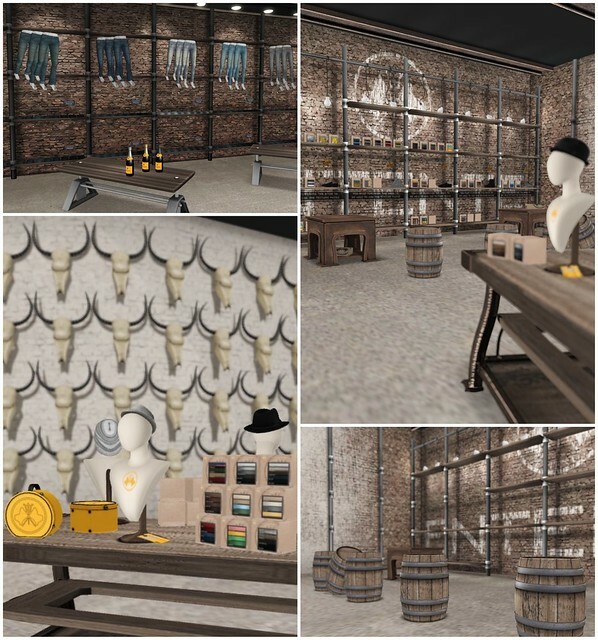 After being teased all week with coming soon notices, Entente finally opens to the public with a large range of items mainly geared towards men in SL, but there are a couple of things for the ladies too. If first impressions are important, I was definitely impressed with the build upon entering. The interior textures are amazing and so realistic and the displays are very well done. I liked that the build was spacious, and really easy to navigate. I spent too much time taking pictures of everything, that I didn’t get a chance to grab demos of all the things on display. From what I’ve seen, this brand has a lil’ bit of everything — and probably lots of room for new products. Men’s hair! None for the ladies, yet. More of the build! I hope I was able to rez all the textures correctly, as I was crashing quite often and had to re-rez the entire thing each time. There is an Opening Gifts package at the store filled with a couple of goodies in both Femme and Homme versions. The gift bag is not there anymore, sorry guys! I’m wearing the Sebastien Glasses and Saile Tee from the package. I love these glasses, they’re beautiful and the scripting on the HUD to change textures & size is flawless. I did notice that this top has nice sculpted sleeves, but the seams are so-so; while the stripes are lined up pretty well, it does look unfinished without some shading along the seams. 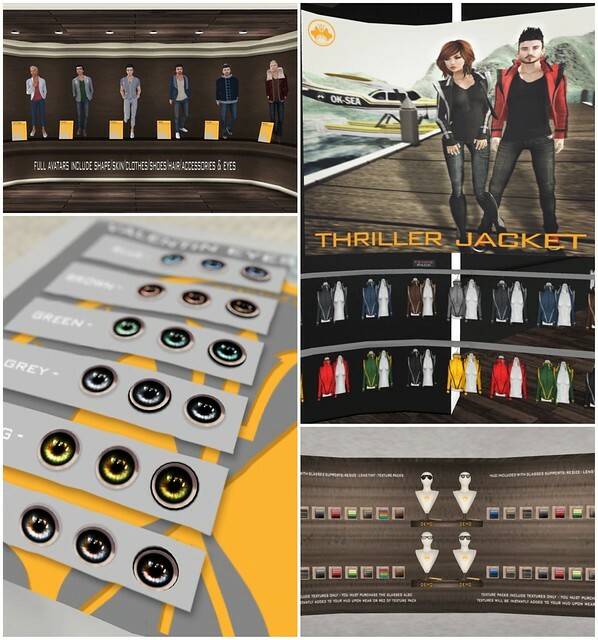 With any brand in SL that is a group effort, I’ve noticed that some designers in the group have more skills than the others. I have no idea who the main avatar(s) behind Entente are, but I have a couple of guesses! Who do you think is behind this brand? I heard it was a collaborative effort between a few established SL designers. Visit Entente, then come back and tell me what you guys think of the build & items! for sure this is not sweetest goodbye! sweetest goodbye’s new brand is “monso” located on the same sim as the old sweetest goodbye. Gogo!! you opened heavens doors to me! thanks! lets go Monso! The skin section options remind me of Fruk but can’t make that claim for sure. Intresting sore though rezzing was not easy. Its London Armidi’s stuff, again, as always, you can note by his jeans that it is the same layer template as armidi’s grace jeans. ofc we havent seen his thousands of stores since a while ago cuz they all closed on the warehouse sale but now we can see one more besides the body co. Thought the same about Armidi. The jeans are definitely from there, since I have the same pair. Ooh! I’m so with you on this! Looking back at the pics, the jeans Do have something rather similar to Armidi’s texture style, obviously different bottoms! Gods I used to shop at Armidi/Gisaci etc constantly! London’s stuff didn’t close, that warehouse sale is still up and so is Armidi and the Abyss. He seems to do things like this a lot though, start a store make 1 or 2 things, create a lot of hype then leave it. Parts of the build reminds me of Theosophy, perhaps Trace is apart of the Entente team. The skins remind me of Wavie Haller’s Sacred Skin line. Naith Smit is definitely a part of it since the hair is very NSD-like, not to mention the shape used in the advertising. Rob of FIR&MNA seems to be a contributor too when we consider some of the style and quality of the clothes on sale. So I was on my way to Entente having only just gotten enough time to visit when as it happens ColdLogic opened at Zyrra and well I couldnt get away after that….the awesomeness of Mesh!! Gogo please please have a scout there I’d love to see how your pics turn out. Well i just think its all london’s stuff just like that ”vaschwitzugenplatz” which may launch next or after next year, who knows ?? Clothes: Good quality with a nice new style, with some ‘hitches’ such as gaps, difficulty to fit. Hair: Good quality hair, haven’t seen any hair quite using that style just yet. 4/5 Indefinably, worth buying from even though the prices can be a little steep.